The only good thing is how close you are to beach and shops. The size of the apartment and the full length balcony. Great pool area. Friendly staff. Host was friendly, and informed us over Whatsapp on the pending topics. Breakfast in the restaurant located in the building was good. Also the prices were reasonable. We stayed in September - quiet neighborhood, suitable for families, children. Short walk to the beach. Stores nearby. Perfect location , a series of supermarkets and gift shops are on your doorstep. The beach is beautiful and the staff were very friendly and helpful. Very near to the beach, shops and restaurants which was great! The pool was bigger than anticipated and we had a lovely balcony. The staff were really friendly and the beach is beautiful. You can get a ferry to Formentera from Cala Llonga beach which is well worth a trip - to water is so clear it’s like being in the Caribbean! Excellent large balcony. Lots of storage for clothes. Clean. Well equipped kitchen. Really good size rooms. Lovely and close to an amazing beach. Quiet area, perfect for families. The apartment was clean, except the kitchen, which smelt like garlic. The apartment has a very nice balcony. Great location, close to the beach, restaurants and bars. Centrally located. Lovely staff, very welcoming and helpful. Could never do enough for you. Extremely clean apartment and great pool area for both kids and adults. No need to fight for sun beds as plenty for all! Kept up to date on notice boards of events in the area. The Cala Llonga Playa Apartments are apartments well suited for families, thanks to its enviable location on the Cala Llonga Beach, in the east coast of the island and 7.5 mi from Ibiza city. The complex has 50 equipped apartments, a reception, pool, children´s pool, terraces for sunbathing and attractive gardens. There is also a cafeteria with Satellite Television and a games room. Free Wi-Fi access is available. 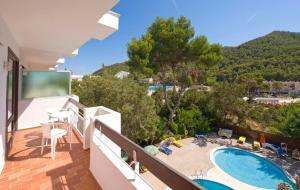 The Cala LLonga apartments feature a spacious terrace and a bathroom. Each one comes with a kitchen with a hob, oven and microwave. TVs, safes and fans are available to rent. Cots can be provided for free. 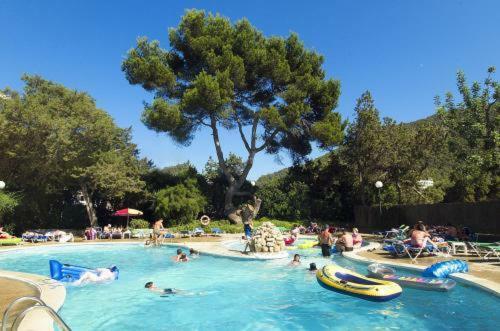 When would you like to stay at Apartamentos Cala LLonga Playa? 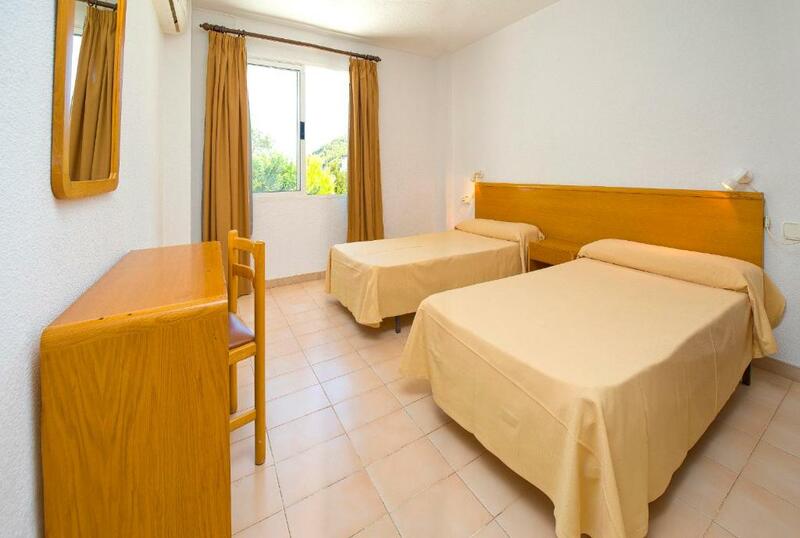 The apartments have two bedrooms with two single beds in each, one living-room with one armchair-bed, one fully equipped kitchen, a completed bathroom and two big terraces. The fan and the safety deposit box are upon request and charges are applicable. This studio has a private bathroom, a terrace and a kitchen. A fan and a safe are available to rent. This simple apartment has a balcony, 1 twin bedroom and a living-dining area with 2 fold-down beds. There is also a kitchenette and a private bathroom. A fan and a safe are available to rent. This air-conditioned studio has a balcony, a kitchenette and a private bathroom. This simple apartment has 2 terraces, 2 twin bedrooms and a living-dining area with 2 fold-down beds. There is also a kitchenette and a private bathroom. A fan and a safe are available to rent. 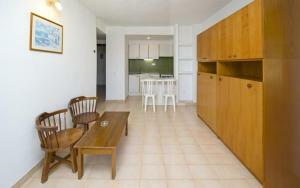 This air-conditioned apartment has a balcony, 2 twin bedrooms and a living-dining area with 2 fold-down beds. There is also a kitchenette and a private bathroom. A safe is available to rent. This air-conditioned apartment has a balcony, 1 twin bedroom and a living-dining area with 2 fold-down beds. There is also a kitchenette and a private bathroom. Los Apartamentos Cala Llonga Playa, son unos apartamentos pensados para el disfrute de unas vacaciones en familia, gracias a su envidiable localización en primera linea de playa, en la costa este de la isla y a 12 km. de Ibiza ciudad. El complejo cuenta con 50 apartamentos completamente equipados, dotados de recepción, piscina, piscina para niños, terrazas para tomar el sol y jardines, cafetería con TV satélite y sala de juegos, acceso a Internet y Wi-Fi gratuito. 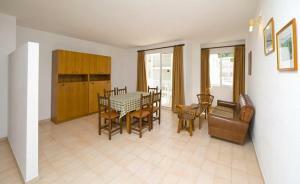 House Rules Apartamentos Cala LLonga Playa takes special requests – add in the next step! Apartamentos Cala LLonga Playa accepts these cards and reserves the right to temporarily hold an amount prior to arrival. The hotel reserves the right to pre-authorize credit cards and charge one night's stay. 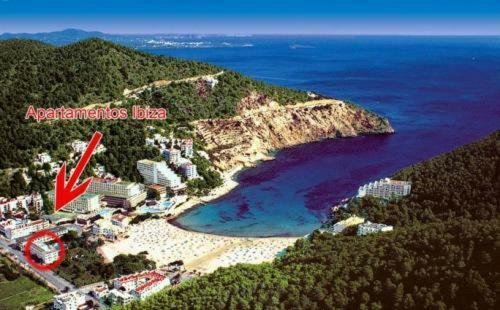 Please inform Apartamentos Cala LLonga Playa of your expected arrival time in advance. You can use the Special Requests box when booking, or contact the property directly using the contact details in your confirmation. Im in a self catering apartment with no electric kettle or toaster. The kettle was an old fashioned thing we had to use on the cooker but it had no whistle so if you didn't watch it it put out the gas flames. Could be dangerous. Even though wi-fi was advertised you cant get it in your room. Can only be accessed at the pool or in the café. The rooms are very old fashioned and need updating. The furniture was very uncomfortable. No air con. Did not find the beds (two singles that we pushed together) very comfortable. No electric kettle. Make sure you get a air con room! Our room didn’t have this so we had to hire a fan from reception. Very dated in need of modernising! Our room for 6 people was fine but it was a little cramped. Aside from the property, the buses to Ibiza town and other nearby towns stopped at around 8pm so it’s not the best location for exploring if you don’t have a car. Worst service apartment. Please be aware when you book this apartment as they don't tend to provide all the details about the beds and bathroom is disgusting. They give cheap spring mattress with the beds, each bed is small single kid bed. They don't change the towels, sheets and don't even clean the apartment for first 3 days of your stay. All the furniture was too dated , old smelly bedding, no cleanliness, no hand soaps in bathroom. Arrogant staff too. Fantastic location, nice rooms with comfy beds. We stayed in the older part or unrefurbished part and the rooms were extremely hot. We managed to get a fan but the rooms were extremely uncomfortable at night time. Windows had to be kept open, we overlooked the road and there was a lot of noise from other apartments and the road at night. Given the heat at night, our sheets were only changed once on a 10 night stay which wasn't nice. There seemed to be people staying there who had been before and got the nicer rooms, think they had air conditioning. The wifi situation is misleading as there's are no common areas that receive it. Managed to get some wifi by the pool but the only reliable connection is in the cafe and I felt as though you had to buy something to be able to sit at a table and use it. On our penultimate day this was confirmed but being told by the man in the cafe that the owners were nearby and they were in fact running a business and we could not sit on a table by the pool without buying something. I am not sure whether the owners of the apartments live on site but they seemed to be there a lot and used it for their family/friends gatherings. Just didn't think it was very professional.